“Ponder the path of thy feet” (Proverbs 14:26). One of the current Prophetic Priorities set by the Prophet and First Presidency of the Church is to focus on Sabbath Day observance to strengthen individuals and the family. During the October 2015 General Conference I asked my children to specifically listen for speakers who mentioned the word Sabbath. We counted at least nine talks! For a recent FHE lesson I compiled all of the references into one sheet. We picked one to really focus on for the week, and an accompanying scripture (we say it every morning during the drive to school). For the rest of the week at dinnertime we picked an additional quote to discuss. Scripture of the week: “And hallow my sabbaths; and they shall be a sign between me and you, that ye may know that I am the Lord your God” (Ezekiel 20:20). To help our family remember I created a poster using this meme, and also included the scripture on the bottom. Here is the compilation of teachings about the Sabbath day from the October 2015 General Conference. Another important doctrine that we should cling to is to observe the Sabbath day. This helps us remain unspotted from the world, provides us with physical rest, and gives each of us the spiritual refreshment of worshipping the Father and the Son every Sunday. When we delight in the Sabbath day, it is a sign of our love for Them. For members of The Church of Jesus Christ of Latter-day Saints, honoring the Sabbath is a form of righteousness that will bless and strengthen families, connect us with our Creator, and increase happiness. The Sabbath can help separate us from that which is frivolous, inappropriate, or immoral. It allows us to be in the world but not of the world. In the last six months, a most remarkable change has occurred in the Church. This has been in the response of the members to renewed emphasis on the Sabbath by the First Presidency and Quorum of the Twelve and to President Russell M. Nelson’s challenge to make the Sabbath a delight. Many members understand that truly keeping the Sabbath day holy is a refuge from the storms of this life. It is also a sign of our devotion to our Father in Heaven and an increased understanding of the sacredness of sacrament meeting. Still, we have a long way to go, but we have a wonderful beginning. I challenge all of us to continue to embrace this counsel and improve our Sabbath worship. If you receive a spiritual impression to honor the Sabbath day, especially when it seems difficult, God will send His Spirit to help. Simple obedience brings the Spirit into our hearts. In our homes, we pray in faith, search the scriptures, and keep the Sabbath day holy. In our chapels, we partake of the sacrament and make sacred promises to our Heavenly Father in the name of Christ. Two essential weekly signposts that mark our journey back to our Father in Heaven are the perpetual covenant of the ordinance of the sacrament and our Sabbath day observance… If, in remembering Him each Sabbath, we turn our hearts to the Savior through these two important signposts, our efforts are again more than matched by the Lord by His promised blessings. We are promised that, with devoted Sabbath day observance, the fulness of the earth will be ours. I believe that starting a tradition of telling the stories of Jesus to our children and families is a very special way to keep the Sabbath day holy in our homes…I am grateful for our leaders, who are constantly teaching us about Christ, about keeping the Sabbath day holy, and about partaking of the sacrament each Sunday in honor of the Savior. The Sabbath and the sacrament become much more enjoyable as we study the stories of Christ. In so doing, we create traditions that build our faith and testimony and also protect our family. Recently, living prophets have counseled us to “remember the sabbath day, to keep it holy,” and to live the law of the fast. Obedience to this prophetic counsel provides a way for us to be obedient to God’s commandment to love Him and our neighbor as we increase our faith in Jesus Christ and extend our hand to love and care for others. What a wonderful General Conference weekend! All of the messages were so inspiring, and so many of them addressed concerns that I have been praying/pondering about. It was interesting to witness the calling of three new apostles. 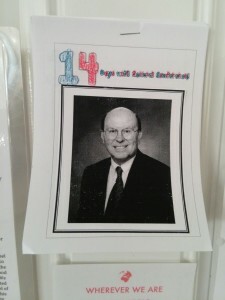 I especially liked Elder Bednars talk: with the passing of Elder Perry, Pres. Packer, and Elder Scott I had gone back to review their recent messages. I have also been curious to hear what the last counsel of a prophet/apostle is before he dies, but hadn’t studied it out yet. It was heart-breaking to watch Pres. Monson struggle to deliver his message–we prayed for him as he spoke, as I am sure many others were doing. He truly is a man who has given his life to serving the Lord and His purposes. Now begins the wonderful task of studying and integrating the messages in our lives. In just a few short days the talks will be available on the Gospel Library app. I usually read 1-2 talks a day until I have made it through all of the sessions, highlighting key sections. I mark the messages that we should study further as a family, and we discuss them usually through Family Home Evening lessons. We will also continue to teach our children about the apostles, and especially help them get to know the new apostles. I liked the ideas for General Conference recap shared here. 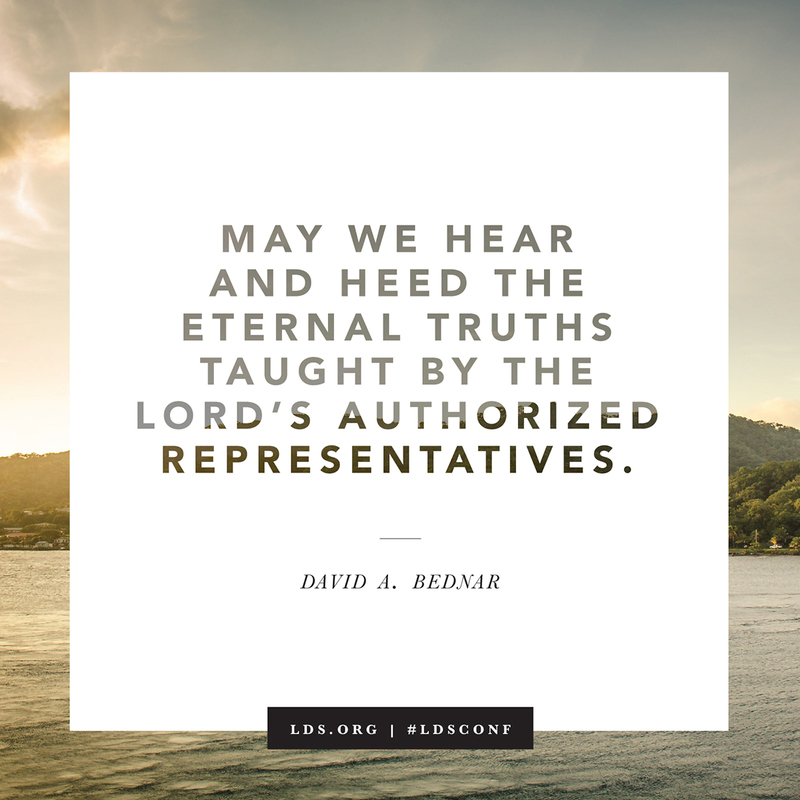 What will you do to make General Conference a part of your daily life? General Conference is almost here! I am so thankful that twice a year we get to sit at the feet (so to speak) of living prophets and apostles. Last week I was able to lead a discussion for a Relief Society activity where the theme was “Celebrate General Conference”. I truly believe that General Conference is special and something worth celebrating.Read on for the ways that we are celebrating General Conference in our family this year. “Oh, how we need general conference! Through conferences our faith is fortified and our testimonies deepened” (Elder Robert D. Hales, source). Last Sunday evening we watched the following video as a family to help put us in the mood for General Conference. We have also been doing our nightly countdown–we have missed some nights, but we just do two the next night to catch up. This year I created my own note-taking booklets for my children. I want my children to at least focus on one key word from each apostle’s talk, and I liked this Sugardoodle packet from a few years ago. I just used the speaker note pages, cut them into thirds, and then assembled it with some colored paper and a few extra sheets of paper, as inspired by this booklet. We always enjoy the Color the General Authority tie page from this packet by Sugardoodle. These Conference Watches are fun. Who is that apostle from this packet by Sugardoodle. 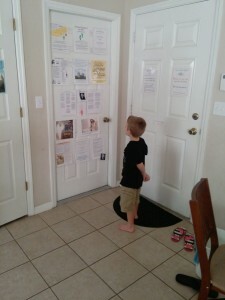 No Ordinary Blessing by President Uchtdorf (poster in this packet by Sugardoodle). Various activity sheets from this packet by Heap a Hoopla. Do-a-dot First Presidency Pages: ours are laminated and we use them with magnetic pom moms. Hang up pictures of the First Presidency and Twelve Apostles. After they speak, we will write keywords or quotes or draw pictures on post-it notes and place it on their photo (we have the 8×10 photos available here). We will be using these headband cards to help us keep track of the topics. The cards will be posted on the wall, and when a speaker talks about a topic we will write their name on a post-it note and place it near the topic. Display a large world map. When countries are mentioned in conference (for new temples, stories, etc) have the child put stickers on that place on the map. Here is our menu and activity plan for the weekend. Since we live in Florida, our viewing times start at noon and 4 p.m., which puts it exactly at mealtimes. We do our best to work around that. Breakfast: crepes with strawberries, bananas, nutella, powdered sugar and cream. Lunch: Finger foods–cheese cubes, deli slices, veggie tray and dip, tortilla chips, crackers, apple slices…and cinnamon rolls! Dinner: Herb Roasted Pork Tenderloin, Dad’s mashed potatoes, homemade rolls, and mixed veggies. Conference session spa: relax and serve each other with hand massages, hair brushing, and manicures. New dry-erase markers and pens in assorted colors to make note-taking fun. Make use of LEGO: construct a temple, or something else. Build a new set together. Get outside in between sessions: go for a nature walk or a family bike ride. Draw with sidewalk chalk, blow bubbles, etc. Remember not to be a shusher: help the children to have a positive experience. If I miss something, I can always read the talks again. I have posted this before, but each of these messages are especially timely to review before General Conference. Elder Robert D. Hales, “General Conference: Strengthening Faith and Testimony”. October 2013 General Conference. Elder Neil L. Anderson, “Teaching Our Children to Love the Prophets”. April 1996 Ensign. President Dieter F. Uchtdorf, “General Conference-No Ordinay Blessing”. September 2011 Ensign. Lastly, a few ideas for Visiting Teaching friends: motivators with Gatorade or water bottles. You can read what we did last spring here. My husband taught a great Family Home Evening lesson tonight based on Elder Pearson’s recent General Conference talk, Stay by the Tree. He had the children follow a path and stopped to discuss each principle on enduring to the end from Lehi’s vision of the tree of life that Elder Pearson taught. Search the Book of Mormon and the words of the living prophets every day, every day, every day! After dessert we ended the evening with our family study of the Book of Mormon. Up to this point we have been taking turns each reading (or repeating) a verse each day. We have been using the Gospel Library app on an iPod and passing it around to each person when it is their turn to read, but a few days ago I felt that our scripture reading would be more meaningful if each person had their own scriptures to follow along with as we read. So I gathered up hard copies of the Book of Mormon (enough for each member of our family), ready to go in our living room in a basket. Tonight we used them for the first time, and the children were excited to touch and read their own copies. We spent a few minutes orienting them to the book, and helped them find our current place in Mosiah. It was a testament to me of the power of the scriptures to see how much the children were drawn to them. I wish we had done this sooner! Search the Book of Mormon and the words of the living prophets every day, every day, every day! It’s the key to spiritual survival and avoiding deception. Without it, we are spiritually lost. If you are struggling, confused, or spiritually lost, I urge you to do the one thing I know will get you back on track. Begin again to prayerfully study the Book of Mormon and live its teachings every day, every day, every day! I testify of the profound power in the Book of Mormon that will change your life and strengthen your resolve to follow Christ. Elder Kevin W. Pearson, “Stay by the Tree”. April 2014 General Conference. General Conference is just two weeks away, and we are getting ready at our home! I saw this countdown calendar at the Red Headed Hostess and I thought it would be a nice conference tradition to add this year. I printed off her sheets four to one page, so each countdown sheet was just 1/4 sheet. My daughters colored the numbers and glued a picture of an apostle on each page. I stapled it all together and placed it in a prominent place in our home. The plan is to pull off one countdown picture each day and briefly review what that apostle spoke about at the recent General Conference. The numbers work out pretty well since there are 14 days and 15 apostles and First Presidency (we will just double up on one day). 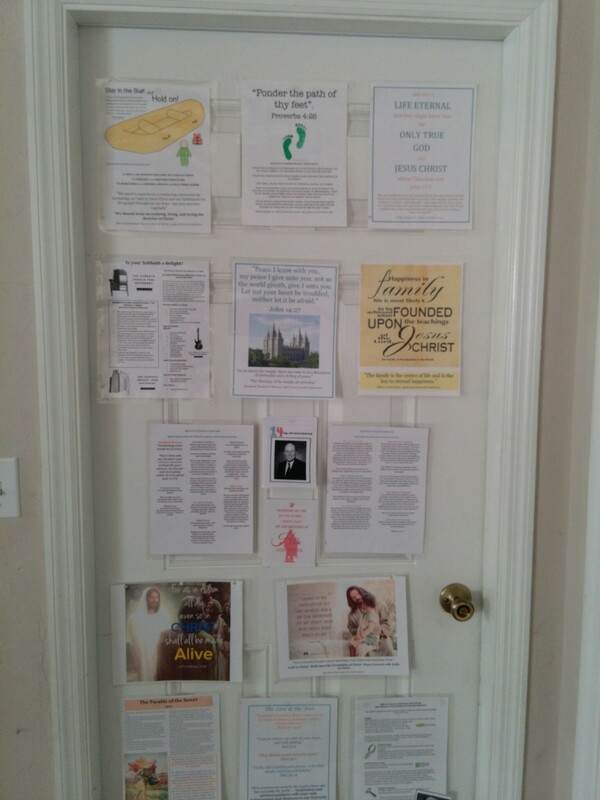 I also decided to cover the door with the posters of scriptures and quotes that we have used for Family Home Evening lessons that were based on General Conference. It didn’t take long for my children to find them and start reading them! Elder Neil L. Andersen, “Teaching our Children to Love the Prophets”. April 1996 Ensign. I mentioned before that I am striving to make the messages from General Conference a part of my everyday life. I went through the April 2015 General Conference and pulled out the key quotes that had the most relevance and significance to me. Having all of the quotes in one place makes it easy to review the important words. 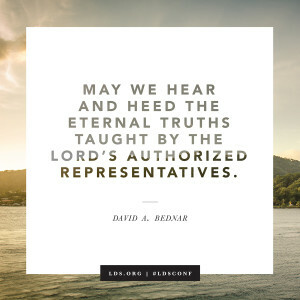 I posted the words of the First Presidency and Quorum of the Twelve Apostles here, and today I am sharing quotes from the rest of the speakers in the general sessions. Sisters and brothers, how often do we intentionally “speak kind words to each other”? Our children’s happiness depends on their ability to hear and love the beautiful music of the gospel. The service that counts most is usually recognized by God alone. Answers to our sincere questions come when we earnestly seek and when we live the commandments. The Lord said, “[Seek] me in every thought; doubt not, fear not.” Seeking the Lord and feeling His presence is a daily quest, a worthwhile effort. We learned in our family that, after all we can do, we love that person with all of our hearts and we watch, we pray, and we wait for the Lord’s hand to be revealed. Enduring to the end is the great test of discipleship. Our daily discipleship will determine our eternal destiny. Awaken unto God, cling to truth, keep your sacred temple covenants, and stay by the tree! Understanding the plan will help people keep the commandments, make better decisions, and have the right motivation. The Lord knows what He wants to accomplish with each one of us. He knows the kind of reform He wants to achieve in our lives, and we do not have the right to counsel Him. His thoughts are higher than our thoughts. Heavenly Father has charged and blessed us to be fruitful, to multiply, and to subdue the earth that we might become like Him. He has made help available that we may each, according to our individual choosing, actually grow to become like Him. This talk was inspiring to me, as a reminder to take seriously my role as a teacher of gospel principles to my children. My daughter Lily is turning eight next month, so we are currently planning lessons and discussions focused on the importance of baptism, making covenants, and the Holy Ghost. Tad R. Callister, “Parents: The Prime Gospel Teachers of Their Children.” October 2014 General Conference.